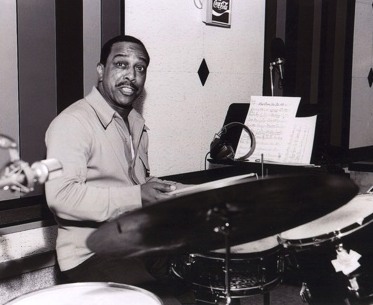 James Charles Heard was an American swing, bop and blues drummer. He obtained his first important professional job with Teddy Wilson in 1939 and continued performing into the 1980s. He performed with Lena Horne, Coleman Hawkins, Dexter Gordon, Benny Carter, Cab Calloway, Erroll Garner, Jazz at the Philharmonic, Pete Johnson, Charlie Parker, Sir Charles Thompson, Dizzy Gillespie and Roy Eldridge besides leading his own groups. In 1946-47, he recorded with top bop musicians, led his own band at Cafe Society, was a member of Erroll Garner's trio, and toured with Jazz at the Philharmonic. In the years 1953 through 1957, he spent time in Japan as a singer/entertainer, mentoring young Japanese singers and musicians like Yukimura Izumi, George Kawaguchi and Franky Sakai. During 1957-66 he freelanced in New York (playing with the Coleman Hawkins-Roy Eldridge Quintet and with Teddy Wilson's trio in 1961). In 1966 J.C. Heard moved to Detroit where he worked as a bandleader and a mentor to younger musicians into the mid-'80s.